A couple months ago I was approached by Brandon, author of the blog Latter-day Sustainability, with a proposal to team-up on administering an informal survey about the environment to Latter-day Saints and those familiar with Latter-day Saint teachings. The goal and objective was to learn more about Latter-day Saint members’ views on the environment, including how the LDS Church informs those views. I thought it was an interesting project, and so I agreed. Peter, a member of the LDS Earth Stewardship group, also joined our team. Over the last couple months we have been engaged in compiling, editing, and reviewing a survey to be taken by anyone who is familiar with the LDS Church or its teachings. We split up the task of producing questions, and of editing them. We also each sent out a test survey to several people to get their feedback. We believe we’ve come up with a good survey which will help us gather good data on LDS views on the environment. There was no cost to us in administering this survey. The survey will be open until November 15th. Comments are intentionally closed to help prevent discussion before taking the survey. Please feel free to share the link of the survey with your family and friends, or anyone who is familiar with LDS teachings. After the survey closes we will analyze the results and post those we find most interesting for discussion. Results will also be available to anyone with a reasonable request. More information is available on the introduction page of the survey. To contact the administrators with questions or comments about the survey, please email ldssurvey at gmail dot com. Will The “Heathen” Most Likely All Be Exalted? I finally found the scripture I was thinking of when I wrote that “the heathen” who “died without law”, (that is, without having heard any form or portion whatsoever of the gospel) are still likely to be saved (and most likely even exalted) in the Celestial Kingdom. I’ll admit that there is still room for interpretation in light of Section 76, and of course Christ is the final judge of every individual. Mexico City Temple Celestial Room. Photo © 2008 Intellectual Reserve Inc. The Church’s Newsroom has reported that after 19 months of remodeling the Mexico City Temple will be reopened for public tours, after which it will be rededicated on Sunday, November 16th, 2008. Guided public tours will be held from October 20th through November 8th. 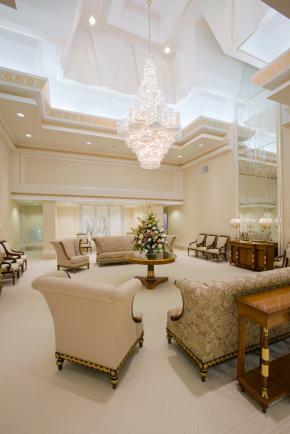 The temple was originally dedicated on December 2, 1983, and currently serves 264,000 members in Mexico. There is a short article on the Newsroom’s website with some history of the temple, and some great photos of the exterior and interior of the temple. Note that after the temple has been dedicated that the photos of the interior are removed. So take this chance to see the beautiful interiors. Dr. Kathy Larsen has been a regular reader, commenter, friend, and selfless supporter of TempleStudy.com and many others, and has sadly been recently told that her cancer is returning. It sounds like it may have been in remission for a time, but is now coming back. We would just like to get the word out so that as many as possible may keep her in their prayers. We will be sure to put her name on the prayer roll of the temple too. David at HeavenlyAscents.com and I will be fasting for her this coming Sunday, October 19th. If you would like to join with us in this fast, you are welcome to. We pray that this difficult time will be a time of peace, comfort, and consolation to Dr. Larsen and her family, and that the Lord may bless them. “And the prayer of faith shall save the sick, and the Lord shall raise him up… and pray one for another, that ye may be healed. The effectual fervent prayer of a righteous man availeth much.” (James 5:15–16). Woodcut. Author unknown. From "The book of pictures and parables, fables." Oxford University. 1859. One of our readers, Walt, emailed me a link to a fable that is intriguing. 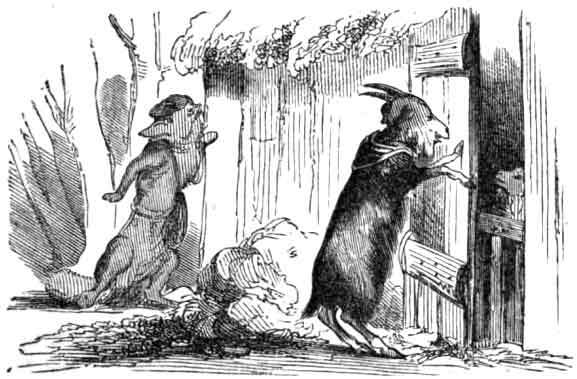 It is entitled “The Wolf, The Goat, And The Kid,” and was originally penned by the popular 17th century French poet and fabulist Jean de la Fontaine. With paws of that complexion. The wolf by chance had overheard!